Everyone loves John Yeoman (b. 1934) and Quentin Blake (b. 1932), at least everyone old enough to remember their quirky stories. They have collaborated since childhood on dozens of projects starting with A Drink of Cold Water which was first published in 1960 and was the first book Blake ever illustrated (re-released in 2017 and reviewed here in November 2017). 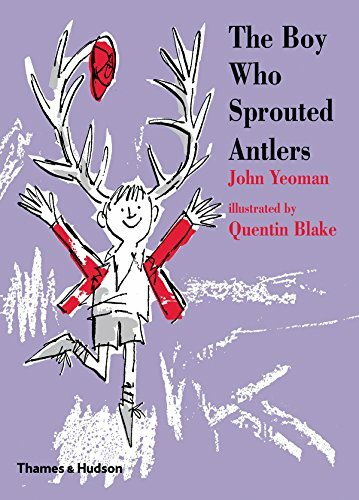 The Boy Who Sprouted Antlers is another re-release, first published in 1961. Our protagonist is a schoolboy named Billy. Billy is failing miserably at his basket-weaving class project. The stern teacher scolds him in front of the entire class for his “messy, careless, untidy work.” She proceeds to actually tear apart the basket, punish Billy by taking away a class privilege, and make him stay after school. During his detention the teacher chastises Billy again. She admonishes him to do better, or else. Her harsh words pronounce, “As long as you set your mind on it and try hard enough there’s nothing you can’t do.” Billy share’s this “try harder” prescription with his friends who think it was a very stupid thing for the teacher to say because some things a person just can’t do no matter how hard they try: like grow horns. Thus begins the story of Billy, now thinking, focusing and trying as hard as ever, to grow horns on the top of his head. Low and behold, the very next morning two little bumps appear just where he wanted them. Things change rather quickly for Billy, and he is soon proudly sporting a fine six-point rack. Accommodations need to be made for Billy and his antlers. His sleeping arrangements, his desk location, his ability to play games during recess, all must be reconsidered on account of the size and spread of his head. Unintended consequences aside, Billy also becomes the school hero by head-butting a burglar. The teacher mellows out, the principal honors him with an award, his parents are proud, his friends are impressed. Fanciful and silly, this is an imaginative story. Playful antics and innocent snafus are amusing and lighthearted. The humorous line drawings illustrate the curious dilemmas a full rack of antlers might present in Billy’s life. The single red color is used to great effect, adding energy and definition, creating a timeless feel. Where the illustrations feel fresh and current, the story and the characters are dated, or perhaps are more familiar to a British culture. Billy and his friends, his teachers and his parents do not resemble modern day Americans. It is unlikely that today’s elementary school kids will feel much camaraderie with Yeoman’s cast. The mean-spirited teachers, the milk-monitor honor, the nurse sending a student home early with a note, a thief in the principal’s office, even a house-calling doctor, are not part of our kids’ reality (although one may meet with dissent regarding mean-spirited teachers!). Parents forcing an aspirin on their son because he was preoccupied and daydreaming; a fireplace in the school; oddly British word choices: forms, bilge, lollies, pips, fifes, school dinner money (instead of lunch money) and plenty of fancy-ing, indeed-ing and quite-ing all set this story in a different time and place. Valued for their charm and nostalgia for a bygone era, Thames & Hudson is doing a great service by keeping Yeoman’s and Blake’s stories alive. Here stands an opportunity for The Boy Who Sprouted Antlers to become a classic for the next generation to fall in love with.